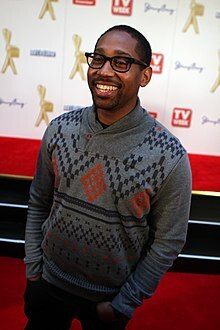 PJ Morton (born as Paul Morton Jr.; March 29, 1981) is an American musician, singer, songwriter and record producer. Since 2012, he has been one of the keyboardists, alongside Jesse Carmichael, for the pop rock band Maroon 5. Morton originally joined the band as a touring member in 2010 and became an official member in 2012 after Carmichael went on indefinite hiatus (he returned to the lineup in 2014). Morton released his debut solo EP, Following My First Mind, in March 2012, through the record label Young Money. Adam Levine and James Valentine were featured on the lead single, "Heavy". In May 2013, Morton released his first major-label debut album, New Orleans. In 2016, he released his mixtape Bounce & Soul Vol. 1 in March and the Sticking to My Guns EP in July. On April 14, 2017, Morton released his first self-released studio album Gumbo, earning Morton two Grammy Award nominations for Best R&B Album and Best R&B Song at the 60th Annual Grammy Awards. Morton was born in New Orleans, Louisiana. His father is Canadian-born American gospel singer and Founder of the Full Gospel Baptist Fellowship, Bishop Paul S. Morton. His mother is Dr. Debra Brown Morton, pastor of Greater St. Stephen Full Gospel Baptist Church. He is married to Kortni Morton. Morton graduated St. Augustine High School and majored in marketing at Morehouse College, graduating in 2003. In 2010, Morton's friend and Maroon 5's musical director Adam Blackstone asked him to audition for a position in the band as keyboardist and backing vocalist. Morton was the first to audition and left an indelible mark on the group. Since then, he has played with Maroon 5 in concerts and other live performances. From 2012 to 2014 Morton filled-in for the band's keyboardist, Jesse Carmichael, who was on an indefinite hiatus from performing with the group, as stated on their official website in March 2012. In 2012, he joined the band as a full-time member, contributing his vocal and keyboard parts on Maroon 5's fourth studio album, Overexposed, and continuing to do so during the processes of recording the band's 2014 and 2017 albums, V and Red Pill Blues. Morton's solo work won the attention of Mack Maine, who signed him to his production company, Soothe Your Soul, and Young Money Entertainment in 2011. The Following My First Mind EP was released on March 27, 2012. On May 14, 2013, Morton released his major-label debut studio album with Young Money Records, entitled New Orleans. The album's lead single, "Only One," which features Stevie Wonder, was nominated for the Best R&B Song at the 56th Annual Grammy Awards in 2014. In 2016, Morton moved to New Orleans and opened a record label called Morton Records which he envisioned as "the New Orleans Motown." Same year, Morton started working on Gumbo. About the album's title he said "I named it Gumbo because the actual dish is a bunch of things mixed in together to make [something] beautiful. I wanted to grow as a songwriter and talk about more things ... about where we are in the world today, the tension, how divided we are as a country. It kind of felt like I was dumping a bunch of subject matter together and I made it in New Orleans so that sounded like gumbo to me." As a first step, on March 25, 2016, Morton released Bounce & Soul Vol. 1, a mixtape which includes re-imagined versions of his best songs in New Orleans' bounce style. On July 1, 2016, Morton released the Sticking to My Guns EP, featuring the single of the same name. The EP, besides including alternative versions of "First Began" and "Sticking to My Guns", it also contains "Say So", a song that was later cut from the final tracklist of the album. On November 15, 2016, Morton released "You Should Be Ashamed", a Stevie Wonder-esque socially conscious song that was later replaced by "Religion". On March 13, 2017, Morton announced on his Instagram page April 14, 2017 as the release date of Gumbo. Gumbo didn't manage to enter on the US Billboard 200 chart but, upon its release, it received positive reviews from most music critics, who complimented Morton's style and praised him for his singing and songwriting. The album earned Morton two Grammy nominations for Best R&B Album and Best R&B Song at the 60th Annual Grammy Awards. On February 14, 2019, Morton collobrated with singer JoJo, on the song "Say So", which was originally appeared on the album. After winning Grammy Awards for his songwriting and production on India.Arie's Interested, Morton won Dove and Stellar Awards in 2008. Morton was also noticed by AR Rahman, composer for Slumdog Millionaire, who asked Morton to contribute "Sajna" to the soundtrack and movie for the Vince Vaughn comedy Couples Retreat. Morton has also produced and written for musicians such as Jermaine Dupri, LL Cool J, Jagged Edge, Monica, India.Arie, gospel musicians Fred Hammond, Men of Standard, Brian Courtney Wilson, and Heather Headley. In 2009, he published a book entitled Why Can't I Sing About Love? ^ a b "60th Annual GRAMMY Awards". May 22, 2018. ^ "PJ Morton Working to Save Buddy Bolden House". The Syncopated Times. ^ "USA GRAMMY ARWARDS 2014". naver.com. ^ "Printing – Discovery: PJ Morton – Interview Magazine". interviewmagazine.com. 2013-11-14. ^ "PJ Morton Talks Transition From Writing Gospel Music to Singing with Young Money Records". UGospel.Com. May 8, 2012. Retrieved 2012-05-09. ^ "Band Announcement – Jesse Carmichael". maroon5.com. March 9, 2012. Archived from the original on April 14, 2012. Retrieved June 16, 2014. ^ "Maroon 5's PJ Morton Talks Young Money Deal". AllHipHop.Com. March 26, 2012. Retrieved 2012-05-08. ^ "PJ Morton of Maroon 5 moves home to New Orleans, opens record label". nola.com. Retrieved May 6, 2017. ^ "PJ Morton of Maroon 5 moves home to New Orleans, opens record label". ^ "PJ Morton talks new album, Maroon 5 and more". ^ "New Music: PJ Morton - Bounce & Soul Volume 1 (Mixtape) - YouKnowIGotSoul.com". March 26, 2016. ^ "New Music: PJ Morton - Sticking to my Guns - YouKnowIGotSoul.com". June 9, 2016. ^ "PJ Morton Addresses The Deplorables On 'You Should Be Ashamed' - SoulBounce - SoulBounce". November 17, 2016. ^ "PJ Morton on Instagram: "MY NEW ALBUM!!!!!! #GUMBO COMING 4.21.17 🍛🥄"". Instagram. ^ "Why Can't I Sing About Love?". WhyCan'tISingAboutLove.Com. Retrieved 2012-04-17. ^ "PJ Morton | Artist". The Recording Academy. Retrieved January 8, 2019.